Back in 2009, I posted this photo on my blog ... without ANY commentary. I'm 99.9% sure it was part of a photo challenge on winter. 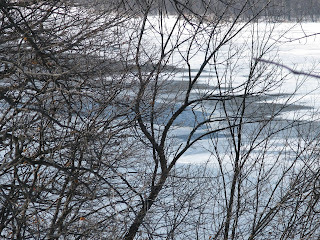 I'm fairly positive it's a picture of the Mississippi River, partially frozen over in March. If you'd like a peek at what I was doing around this time back in 2008, I'd just started a new job. You can read about my 2nd day here. And now for a little Five Question Friday. Thanks for the reminder!☺I can't say I'm really looking forward to it. Springing ahead = losing an hour of sleep, right? I'm already always so tired. Of course, I will appreciate the shift is daylight hours. So, I guess I'm torn. No and no. I'm SO not an Apple girl. Give me a PC any day. Also, we're trying to save all our money for our move this summer. No new toys for us for awhile. Travel, without a doubt! I would go somewhere I'd never been before, stay in a nice hotel, explore all the activities in the area, enjoy all the different traditional foods. I want to see the world! If I can find a cute bikini that is super flattering, then bikini. Otherwise, one-piece. It kind of depends on the activity I'll be doing as well as just how hot it actually is outside. Of course, we're likely moving to FL this summer, so bikini seems like it will be more natural there. Any fun plans for the weekend? I'll be doing the usual - lesson planning. I have a half marathon next weekend, so I hope to get in some running, too. It's been over a week since I've been out. Have a great weekend! Don't forget to spring ahead on Sunday!! Welcome, welcome! I'm glad you enjoyed the blog. I love to hear from new readers. I hope you stop by again. Aha! I'm not an Apple girl, either! Oh, I feel so much better now. I seriously thought I might be the only one on the planet who is all like, "Uh... I don't get it." Doh! I completely forgot about the time change. Thanks for the reminder! I'm bikini, also ONLY if I can find one both flattering and affordable, otherwise tankini. Even though I'm not an Apple girl, I still probably wouldn't say no to free. It's kind of a weakness. A bikini that's flattering and affordable? Good luck!